Woah. What a week. The ole day job required my presence in Kentucky horse country the past couple days. I met with a couple surgeons who are performing a groundbreaking incisionless gastric bypass tune up procedure. You see, even after that major surgery, many of these patients start regaining weight. 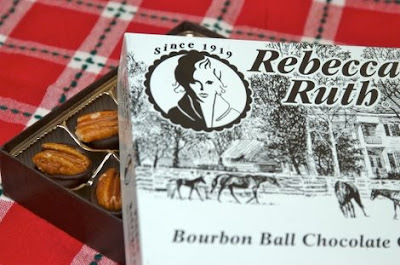 Rebecca Ruth bourbon balls may be a culprit (at least for the Kentuckians). Ruth Hanly (Booe) and Rebecca Gooch, got their start in professional candy making in Prohibition-shuttered bar room. It wasn't until '36 that Ruth started spiking the candy, but what a great idea it was. It may have been two days of contant travel and airport stress, but four of these little things did me in last night.